One of the things about being pregnant when you're already busy with two kids plus work, a house, and other assorted responsibilities is that you don't actually have much time to obsess over your pregnancy. I'm lucky; I tend to have pretty good ones, indigestion and uncontrollable cravings for potato salad aside. And yes, I feel him moving around throughout the day and that's a thrill but otherwise, I forget I'm pregnant. Unless I have to run to catch a bus or train at which point I realize that I am not so fast on my feet. Yet doctor appointments are magical, a time to focus on my body and this baby. I get an ultrasound each visit. Lying there in the dark, watching the baby toss and turn, seeing the blue/red flashes of blood flow and hearing the heartbeat bring me both peace (at 26 weeks, he's doing well) and bliss. During my last pregnancy—ten years ago—3D ultrasound was just beginning to be common in ob-gyn offices, and some charged extra for it. I got one of Sabrina for free, but it didn't come easy. I had to get a neurological scan because of what had happened to Max. The doctor clearly hadn't read my chart because when I was talking about Max having a stroke he said, "What did the autopsy reveal?" I sobbed so hard I could barely talk. "He didn't die," I finally got out. The doctor felt badly. "Here, you can punch me," he said, offering a shoulder. I didn't take him up on it. Afterward, the nurse did 3D imaging, which was almost worth the trauma. Now, I get to see the baby in 3D every time I go for a visit (I ask for it). This time around, I got a good glimpse of his face and I was all: "He has my husband's mouth!" I'm deluded, though, given that little dude is pretty smooshed in there and not yet at his most photogenic. When I showed Max the ultrasound photo, he thought the baby looked like him. Is part of the reason you get 3D ultrasounds because of your high risk? I'm glad Max seemed happy with the baby so far. Is he still talking to him? Keeping ultrasound pictures is cool because later you can show your kids them. My sister and I like to look at ours. Good question. 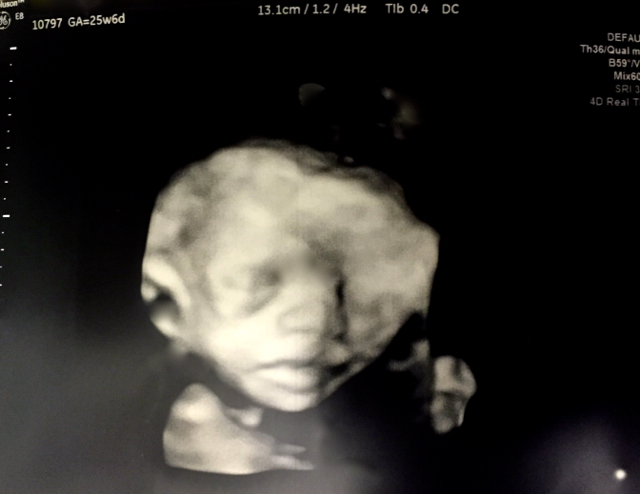 Many ob/gyn practices now offer 3D, but I am getting more ultrasounds and so I get to see more 3D images. And yes, Max is still talking to the baby and regularly leaning over to say, "I love you!" That is so cute. You should try to video it. No decisions on names and when we do, we are going to keep it a surprise! I looked up Tonsillitis. Seems like he had siblings including Meningitis, Appendicitis and Laryngitis. A friend who was a teacher once had a student named Limonjello, named after Lemon Jell-O. Limonjello is fairly unusual for a food name, but definitely more pleasant than Tonsillitis, Laryngitis, Meningitis, or Appendicitis. I had a student many years ago named Zubenelgenubi. (I think his father was an astronomer.) I felt so bad trying to teach him how to write his name! Glad to hear you're feelig well and you get to see the baby in his 3D glory. Some parents choose the most baffling names. I agree with Max; the little guy does look a lot like him!